One year on from the tragic events in Gaza last summer, and the British Israel lobby is still trying to distract us from Israel’s crimes by highlighting perceived wrongdoing by other sides. In her piece for Left Foot Forward, Jennifer Gerber makes a number of claims which require refutation: Hamas’ responsibility for provoking ‘the conflict’; the use of ‘terror tunnels’; Hamas use of human shields; and finally what Gerber laughably calls, ‘Israel’s attempt to avoid civilian casualties’. But the worst distortion of all is the narrative which Gerber is seeking to peddle from her position as director of Labour Friends of Israel – which is that whatever violence its occupation of the Palestinians metes out, whatever injustice is done, Israel is somehow beyond reproach. It is never Israel’s fault. Gerber writes that ‘the lives of all those civilians – Palestinian and Israeli – who died during the conflict are of equal value’ but doesn’t care to mention that the numbers of Palestinian and Israeli dead were 2,251 to 72; or that just six of those Israeli casualties were civilian. Gerber seeks to situate the ‘conflict’ – if that is what one can call such a one-sided massacre – with, ‘the teenagers’ abduction and brutal murder which triggered the war’. By using what some historians call ‘emplotment’, Gerber creates a narrative that starts not with Israel’s blockade of Gaza in 2007, nor when its occupation of Palestine began in 1967, nor even the ethnic cleansing of Palestine in 1947-9. It starts with a Hamas killing in 2014. Let’s take Gerber’s other claims in turn. If ‘terror tunnels’ were the main justification for Israel’s attack, then why did tanks operate a no-go zone in 44 per cent of the Gaza strip and shell schools, hospitals and houses? These tunnels cannot explain the Israeli occupying forces’ murder of Khalil Anati, the 10-year-old boy shot dead by Israeli forces in al-Fawwar refugee camp in the West Bank, or 14-year-old Yousef al-Shawamrah, killed picking plants. On human shields, Amnesty International have found no evidence of Palestinians using them, but evidence has emerged of Israeli troops forcing groups of up to sixty Palestinians to stay in residences and act as human shields. In fact, Israel has a well-documented history of systematically using Palestinian civilians as human shields, particularly children.What Gerber misses out from the report is damning of Israel. Not only did Israel repeatedly deny entry to the Human Rights Council, but they did not reply to any questions from the commission. It details how the blockade has been ‘strangling the economy in Gaza and imposed severe restrictions on the rights of the Palestinians’. Of the 2,251 Palestinians killed, 299 were women and 551 children. 18,000 housing units were destroyed in whole or in part; much of the electricity network and of the water and sanitation infrastructure were incapacitated; and 73 medical facilities and many ambulances were damaged. At one point, 28 per cent of the population of Gaza, around half a million Palestinians, were internally displaced by the bombing. Is it any wonder that Labour Friends of Israel is so keen to draw our attention to the half a dozen Israeli civilians killed by Hamas in the midst of all this death and destruction that was rained down on Gaza? For too long Labour Friends of Israel has been taken at face value, and been granted platforms which it constantly uses to whitewash the war crimes of Israel. It is a losing battle. Last year, Labour’s biggest trade union Unite, which represents over a million and a half workers, voted to support the Boycott Divestment and Sanctions (BDS) campaign in solidarity with Palestine, while the National Union of Students has twice voted since the 2014 massacre in Gaza to support BDS. I wonder whether Labour Friends of Israel will long remain a voice that is taken seriously in debates around the Middle East while its whitewashing is unpicked by countless pages of human rights reports, journalism and documentation of the war crimes of the state they believe can do no wrong. The Gaza conflict in 2014 was 100% of Hamas’ making, starting this futile “war” by firing rockets into Israel targeted at civilians – a clear war crime in itself. Hamas’ is an extremist sectarian Islamic entity which wants to destroy Israel, and since it was elected to power it has first murdered its internal enemies – Fatah, above all – then embarked on a doomed conflict strategy designed to create more ” martyrs” and a never ending cycle of terror and hate. And whilst the West Bank is thriving economically, and still has mixed Christian Palestinian communities, Gaza spirals ever downwards, mainly due to Hamas’ and its sectarian strategies…and biased, deluded people like the author of this article are the last people left who still back and support Hamas’ and its allies. 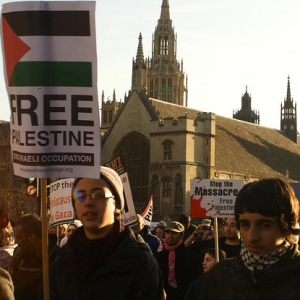 The Jewish State should not be receiving any support from any labour movement organisation. It is a sectarian, genocidal, expansionary state. We must end all talk of the bogus two-state peace process of the Zionists and the Fatah bosses of the Israeli-approved but ever shrinking West Bank bantustan whilst Hamas of course are content to run their gangster regime in the Gaza ghetto. No, the only viable programmatic approach for the left is to support a reunified, secular, democratic Palestine in which Muslims, Jews, Christians and those of no faith can live in harmony and to which the refugees can return to new jobs and homes. That is a revolution that will have to be made not just against the Zionist but Hamas and Fatah too. It will be made by the Palestinians and the Jewish working class once it realises that Israel = permanent war but that will not happen unless the Palestinians make the first move which is as I said to reject comprehensively the bogus two-state peace process. A bantustan and a ghetto do not a nation make. Israeli is a terrorist State. Remind me, don’t Hamas want to wipe Jews off the planet? No dearie. That’s just the ear-worm you’re suffering from listening to too much hasbara. I take it you can’t read otherwise you would have picked up on my less than flattering comments about Hamas and indeed Fatah against whom just as much as Zionism and imperialism the Palestinian National Democratic Revolution will be directed. I was replying to swatantea, and Shirley, I suppose I misheard the nazis wanted to wipe the Jews out too. It’s was right wing Hamas against a right wing Israeli Goverment. Need democratic socialist forces on both sides to work out a way to live peacefully together. Not only Hamas, but also the PLO, cite bloodthirsty Qur’an suras to incite religious hatred against Jews. Consequently all leftists should rigorously abstain from supporting the Palestinian cause, since it hypocritically appeals to traditional leftist notions like human rights and national independence, while in reality it is entirely dominated by religious hatred and genocidal frenzy. Whatever merits the Palestinian cause may have had once upon a time, those days are long past. Under the constant indoctrination of their political leaders, Palestinians have become a threat to world peace. Darwin help us if they ever succeed in destroying the Israeli state, which, despite it many faults, is a bulwark defending the West against what can only be termed Fascist savagery. Zenobia – excellent analysis. And what is even more ironic is now you have ISIS threatening Hamas with “death” in Gaza because Hamas, although fanatical itself, is still not extreme enough for the holy warriors! You couldn’t make it up….but no Left or progressive person, whatever they feel about Israel, should support any Islamic fundamentalist movement in the region. Zionist sectarianism is no less attractive than Islamism and the Jewish state is no less bloody than the so-called Caliphate. They are two sides of the same coin: land grabbing, sectarian terrorists trying to kidnap and bend a religion to their own disgusting fascistic expansionary ends. Well said! In a way the Zionists and Islamists deserve each other; a plague on both their houses. The sooner both are vanquished the better. Your claims are nothing but vague speculation. Please provide some empirical evidence to back up your claim that Israel is as evil as Islamic fundamentalism. Evidently any such comparison is firstly greatly complicated by the task of gathering and classifying evidence, and secondly by the inevitable subjective elements involved in evaluating the facts. But in any case your smug assertions cannot be taken seriously. They are merely ideological confessions of faith. Fascinating analysis, I’m still trying to get a mental grasp on Israel. Well you know Jihadi John? It’s like him only with fighter planes, tanks and artillery. It’s time we had sanctions against Israel. Israel are systematically terrorising and murdering Palestinians. The settlers seem immune from any laws. Certainly Israel doesn’t mind breaking international laws in continuing to evict Palestinians from their land and shipping in settlers. Gaza is deprived of the basic necessities. There is not even enough drinking water. People have no free movement. They are all prisoners really living under an aggressive occupation. I can’t think where else in the world that we would think this is acceptable. There is a fast growing movement of Jewish people living outside of Israel who do not support what Zionism is doing in Palestine. Sue – the main murderer of Palestinians is: other Palestinians! Hamas’ brutally murdered members of Fatah after it won e!ections in Gaza – throwing Fatah members off rooftops, in a chilling foretaste of what the Islamic State do to gay people under their caliphate…and a glance at history would tell you that the Black September events of 1970 when Palestinians tried to overthrow the kingdom of Jordan resulted in the deaths of many many more Palestinians – killed by Jordanians- than in all the “wars” with Israel, including the 2014 one. Look up “Black September” on the web if you don’t believe me! Socialism and social democracy is the only just solution to the conflict, not simplistic and unhistorical analysis and actions like you propose.